All Surface haircare products are formulated with sustainable harvested ingredients and certified organic botanicals because Surface respects personal health and the earth. These organic botanicals aren’t just fillers or alluring fragrances. They are carefully chosen to help you maintain healthy, shiny hair. Bassu Botanical Penetrating Oils: Babassu, aloe and flax seed oil provide the ultimate in penetrating moisture, shine and condition. The Babassu tree is known as ‘The Tree of Life’ and is a superior emollient for dry or oily hair and skin. Aloe is used for its soothing and healing properties while flax seed is rich in antioxidants and is known as nature’s richest source of omega-3 nutrients. Babassu oil melts at body temperature and penetrates hair and skin to deliver healing properties. Trinity Vegan Protein Complex: The gluten-free vegan proteins of amaranth, keravis and soy repair and strengthen hair from the inside out. Amaranth is known as the ‘Never Fading Flower’ and has a natural resistance to UV. Amaranth is noted by the National Academy of Sciences as ‘one of the best protein sources.’ Soy adds flexibility, while keravis adds natural shine. Trinity vegan protein stays flexible with the ability to layer on the hair, creating volume and strength without the risk of delivering too much protein. Trinity also provides peak performance in high humidity and heat. Heat styling maximizes the reconstructive properties of trinity vegan protein. Essential Micro Minerals: A natural addition to hair care is the micro mineral ferments of zinc, copper, magnesium, iron and tourmaline. These natural mineral ferments and antioxidants aid in stabilizing healthy cell turnover. developing new cells and promoting hair growth (anti-aging). Tourmaline aids in overall conditioning and reduces styling time. Botanical Extracts: Botanical extracts of saw palmetto, camellia, ginkgo, hops, balm mint, panex ginseng, maranium and nettle provide a variety of benefits, including working to nourish, encourage and invigorate hair growth while decreasing DHT. 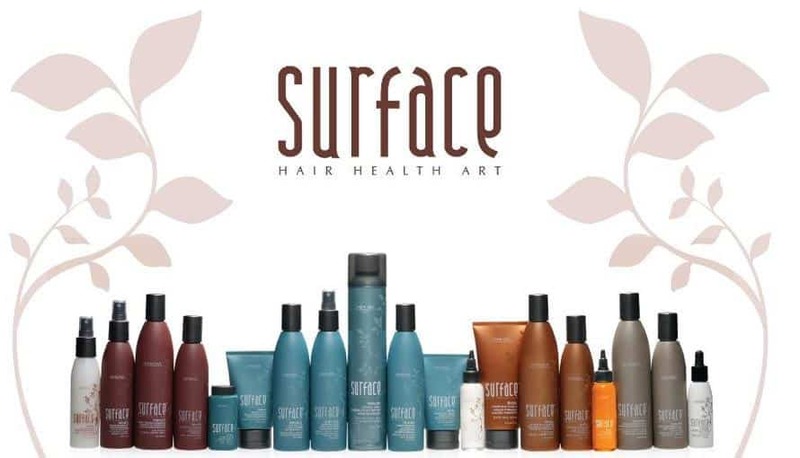 Illusion Unlimited Hair Salons are proud to work with Surface products and to offer them to our clientele for purchase. If you’re looking for an Akron hair salon, North Royalton hair salon or Parma hair salon that cares about the environment as well as its clientele, we hope you’ll consider Illusion Unlimited Salons.